Karate was once defined by a certain high level instructor I know as an endeavor that is both hard and painful - hard as in difficult, not the external or linear aspects. Painful is self-explanatory. Pain for me is not just getting walloped or incurring injuries but also a by-product of arduous training. Karate workouts tend to be very cardio/aerobic in nature. Speaking from experience, the feeling of fatigue brought on by oxygen debt is what, in the words of legendary football coach Vince Lombardi, "makes cowards of us all." Nothing pushes one's boundaries more than a brutal training session (shugyo). Shugyo "polishes the spirit" as Draeger puts it, and can even be undertaken solo sans a group setting, according to Forrest Morgan, author of the now classic Living The Martial Way. The breath is closely related to the (controversial) concept of ki (chi/qi). Kiai (spirited shout) is a manifestation of this force that is not limited to karate. At a recent Japanese Spring festival I attended, a local kendo (sword way) school put on an exhibition match that featured players that liberally employed the kiai. I thought it was a bit much, but then I don't do kendo. Years ago, I took a jiu-jitsu seminar given by a renown Daito-ryu exponent who thought the kiai was "fake" if not downright silly. Shortly thereafter he went on to show a technique that was concurrent with a forceful exhalation. "Why exhale there?" I inquired. "It makes you stronger" was the response. A silent kiai, perhaps? In karate, techniques that are performed with slow, deliberate muscular contractions are frequently executed alongside of forceful breathing. In Isshinryu the kata Seisan, Seiuchin and Sanchin use such methods. Sanchin is a unique form with no real bunkai (fighting applications) - at least none that I'm aware of - that dates back to antiquity. Supposedly it was Sanchin that the mytho-historical figure Bodhidharma brought from India to the Shaolin Temple in China to shock the lethargic monks out of meditative stupor. In reality, the Sanchin kata was probably a cognate of an earlier qigong form used to facilitate respiration and the circulation of blood. One of my instructors would advise to "breathe through the heels" when performing Sanchin. 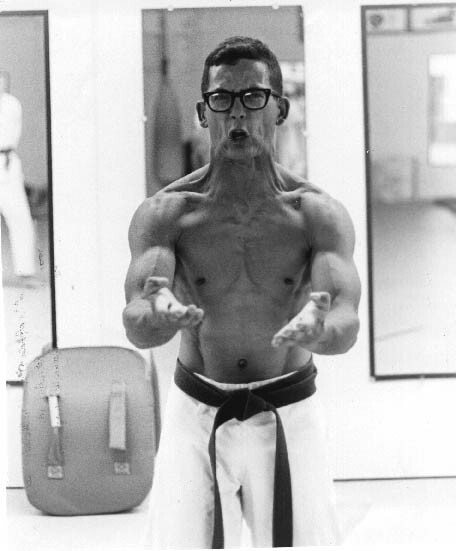 Though not anymore, back in his day (the 60s) Sanchin was the last karate kata taught in Isshinryu. 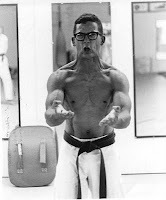 Naturally then, when testing for shodan (1st black belt) Sanchin was the last kata performed after numerous forms had been completed at full power and speed. The now heavily fatigued aspirant was then expected to fight everyone in the school! Talk about shugyo. And no uninspired renditions of kata for testing were allowed, as I once witnessed two candidates fail their 2nd dan promotions for not 'working up enough sweat' through a dozen or so forms. I must say, Sanchin produces a training effect like nothing else. A friend of mine that runs an Isshinryu school nearby does a version of Sanchin utilizing "Dragon Breathing" (i.e. very intense) that he says he learned from Advincula Sensei. When transforming the breath, the inhalation must be full to gather the magic. To gather the magic, fullness must be extended. When it is extended it can penetrate downward. When it can penetrate downward it is magic. When it descends it becomes calm, solidifies, and is both strong and firm. When novices are preparing for a test or tourney I advise them to take a slow, deep breath a moment before a point match or performance of kata. It has been long known that emotions affect the rate of breathing, but the opposite is also true: controlled breathing regulates the emotions. Stan Grof, a pioneer in transpersonal psychology and LSD research, has developed something called holotropic breathing that reportedly brings about altered states of consciousness. Thanks, no. If I want to achieve euphoria or pain-induced ecstasy I'll stick with good ol' martial arts training. In his book, "On Combat," LTC Grossman talks a lot about the sympathetic nervous system response and the effects of adrenaline, mostly in combat and in officer-involved shootings. He advises a technique called "square breathing," to regulate the muscles and maintain poise and clarity, in order to stave off the negative effects of the adrenaline dump: Three second inhale, three second hold, three second exhale, three second hold. In my own experience with police work; high-speed chases, etc., I've tried this, and it works. Regulate the breathing by breathing deeper into the chest, or using diaphramatic breathing, rather than breathing in the upper third of the chest, and I've remained cool and collected, even when the siren is blaring, lights are flashing, or fighting with a combative suspect. It works well when qualifying at the range, helping the hands remain steady, and squeezing the trigger during one of the holding points in the breathing cycle. I do it in karate too, when we spar. As a yellow belt, I was put in with a black belt, and by regulating my breathing, I was able to make a decent showing. Even when I got kicked in the head or punched in the face, it didn't rattle me, and I was able to make some good blocks and counters that I wouldn't have ordinarily been able to make. Consider what happens to your spine as your diaphragm works during breathing. It is attached between the 2nd & 3rd lumbar vertebrae, a point the Chinese call "The Gate of Life". As your diaphragm contracts and relaxes it gently moves that part of your spine forward and backwards. According to tai chi theory, "when one part moves, the whole body moves". That pulling on your lower spine causes two wave to travel through your entire body. One wave travels upwards to your hands and the other downwards to your feet. It's a physical movement, not imagination. Your joints actually move, which movement you should actually be able to feel. Furthermore, your joints move in a precise order. Consider the wave that goes downwards through your legs. After the Gate of Life moves, your sacroiliac moves, then your hip, knee and finally ankle. It causes your foot to press into the ground just as your hand is pushing the other guy away from you. Either the earth is going to move or the other guy! Consider a bull whip. A small flick of your wrist results in a larger and very fast movement at the tip. Your center is like the wrist. It "flicks" and that movement travels up your back and arms and down your legs. When this very real energy (movement) reaches your hand it causes it to move very fast just as the opposite force is pushing hard into the ground through your feet. That is the basis for internal energy. It is not mystical, magical or imaginary. It requires you to move in a very precise, albeit, natural way. Move your center and let the wave move. All you can do with clumsy muscle force is cause the wave to die out. If any joint doesn't move, it is a chi blockage. With this idea in mind, anytime you see or hear the word "chi" or "qi", substitute move, movement or moving and it will make a great deal more sense than most explanations of chi as some kind of mysterious, mystical force. All you do is flick your center and let the rest unwind in a powerful and natural manner. Once you do the center move, do not try adding anything. If you do, it will cause one or more joints to fail to react naturally and cause a chi blockage. All that's left after that is brute, clumsy, muscular force.